Health and dental care. 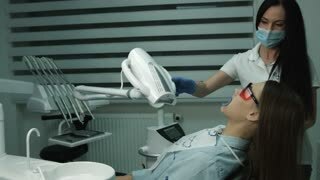 Teeth whitening procedure. Close-up of man's hand turning the illuminated dental lamp at medical office. Dental equipment. Man selling false teeth on market. Marrakech, Morocco. False teeth on sale at local market, Marrakech, Morocco. North Africa. A young female doctor is dressed in a mask and medical gloves. During this, the patient receives a medical mirror and a probe. male is brushing his teeth while looking around. HD. Young male doing dental care. Close up. HD. young male brushing teeth. HD. brushing teeth in front of mirror. Close up. HD. Detail shot of mint toothpaste layered on an electric toothbrush. Detail shot of toothpaste put on an electric toothbrush. Toothpaste is layered onto a toothbrush. A client and the dentist are sitting in the office and talking about preventive methods of keeping the mouth clean after stomatologic the procedures. Oral hygiene and health care. Smiling women use dental floss white healthy teeth.